dry and damaged skin, minor sun burns, and soften rough skin. healthy and radiant. Antioxidant rich. by Susie from Our Simple Farm (click link). and it came out gorgeous ! A real winning recipe ! Pictures below of my version of Susie's recipe. Click link above to get Susie's recipe, or comment below for help from me for formulating your own. If making this, please take note of Susie's sterilization methods from her video. Any question? Need more on this? Just comment below ! Oh Hi Loyda, good to hear from you again. I was so pleased to find Susie's great recipe and tutorial, I just had to try it, but did not have goats milk on hand, sigh. So, in my impatience I tried cows milk, and it turned out so lovely. My family loves it. I am definitely going to get goats milk and try it next. I thought about coconut milk as well. Oh Anna, I love stirred creams. The has become determined to a great. Thank you for the recipe. My hands are in urgent need of care. So I also have to have a go again. Because you were right but hardworking. you and your family I wish you a happy Easter. Hi Tina, sorry if I didn't make the link clear above, you have to click on "Our Simple Farm" ... here it is again.. This is a YouTube video made by Susie Shock that shows you how to make goat milk lotion. It is a great tutorial that walks you thru the whole process. 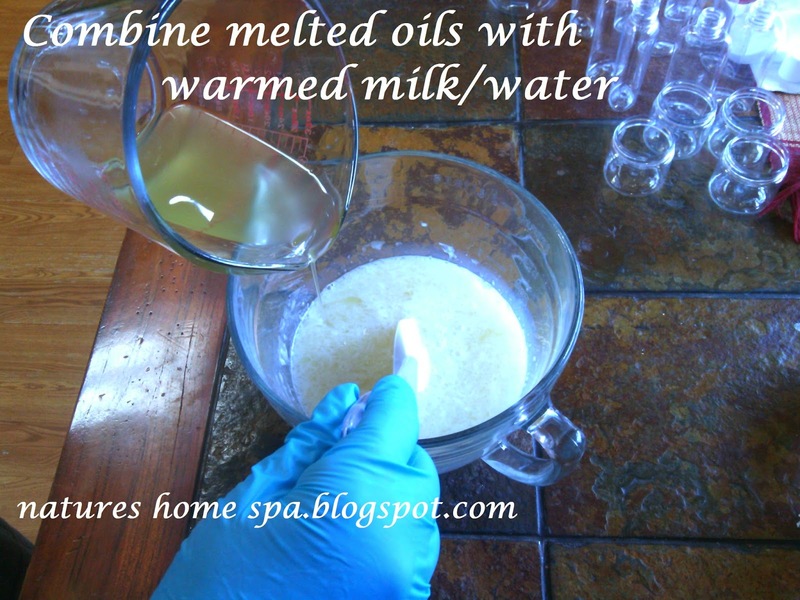 I then put in a picture documentary of my milk lotion that I made with pasteurized cow milk that came out awesome! Dear Anna, I want to know what kind of oil and butter do you use for this ? Hi Sheila, I haven't tested the temp of the milk/oils yet when I make this, but I will next batch I make, and will edit this post! 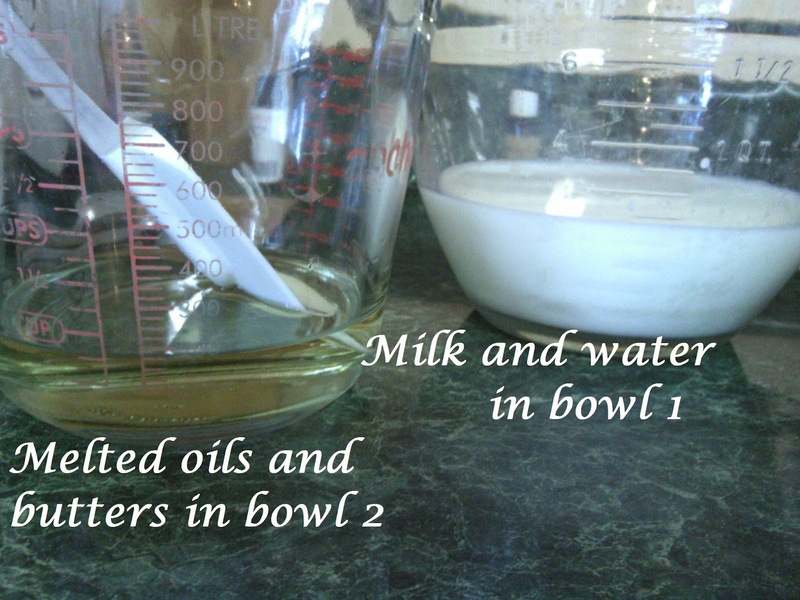 I warm milk and oils in the microwave, not too hot to hinder the preservative, warm enough to blend the milk and oils. If you get a chance, take a look at this YouTube video made by Susie Shock that gave me the inspiration for my (cow) milk lotion. 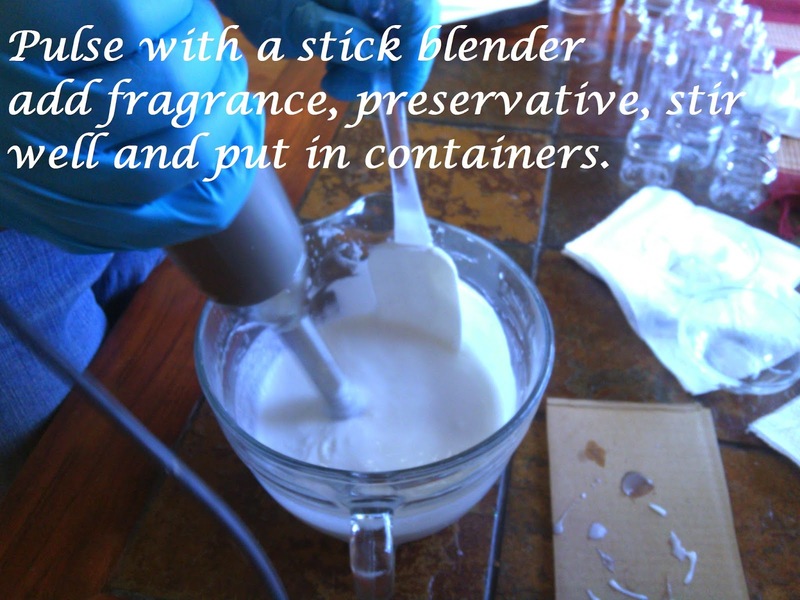 I use a stick blender to blend my lotion, in this video Susie uses a table blender. You will get a good feel on how to make milk lotion from her video. Hi Anna, first thank you so much for your wonderful website. It is so nice of you to share so much information. I have been making goats milk soap for a while and am ready to take the next step with lotion. I have a couple of questions. Is this a non refrigerated recipe? How long does it stay good for? And does this change with the milk to water ratio? i.e. with less milk and more water will it keep longer? Or is that all dependent on the amount of preservative you use? Hi Clara, thanks for the kind words! 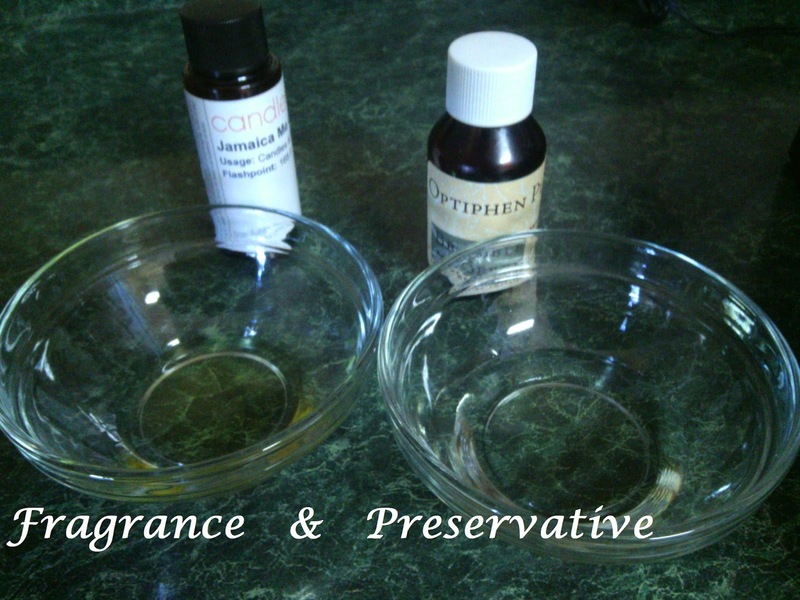 With the preservative added to this lotion recipe you do not have to keep it refrigerated. It has kept for me for over a year with the correct amount of preservative in it. 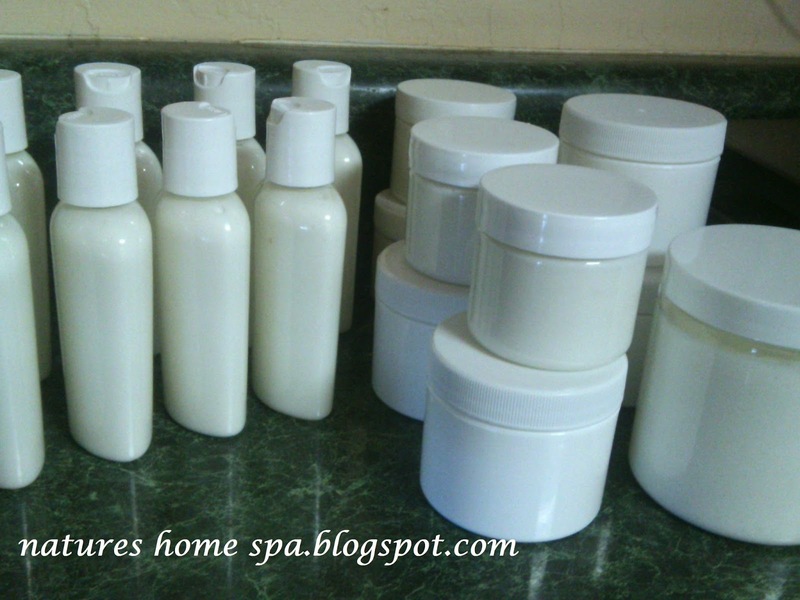 Here is a link to a gal that makes a great goats milk lotion video. This helped me get started. I basically do what she does, except I do not use a blender. I use a stick blender, it works great. Actually watching someone make something really helps. I like the ratio of half water and half milk personally, because I like how it feels. Many use all milk and it works just fine with their preservative. It can also be found in my blog post.